The Z1 Dashboard software is a comprehensive suite of displays designed to help the sim racer get the most from their sim racing experience. Compatible with many of the most popular modern sims, including iRacing, rFactor 1 & 2, Assetto Corsa, Automobilista, Project CARS, Kart Racing Pro, ARCA Sim Racing, Game Stock Car, and SimBin sims, the Z1 Dashboard software will auto detect the sim you are running and then choose the correct dash to display from its list of pre-defined sim-racing dashboards. 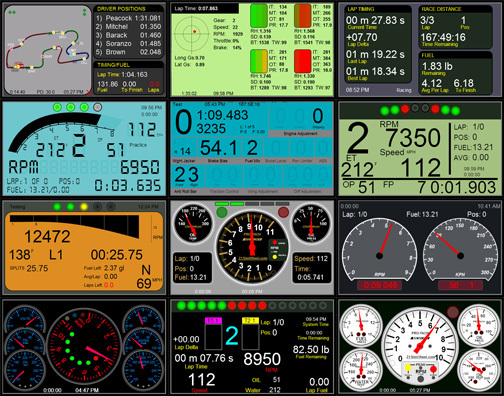 With over 80 different dashboard variations there is one for every sim racer and every car. You can customize the Z1 with each car having up to 10 dashboards. You can scroll through these dashboards with a click of a button. If that is not enough for you or you want multiple dashboards displayed simultaneously, then multiple instances of the software can be run, each displaying different dashboards. But the Z1 Dashboard software is not just about displaying dashboards. It is also a tool to help you get the most out of your sim racing experience allowing you to finish as high up the order as possible. There are real time track maps to show you where you are on track compared to your competitors, and where you will exit after your pit stops. There are timing and scoring screens to provide detailed lap times, position, laps and fuel information. Fuel management is a crucial part of racing. The Z1 Dashboard software provides you will all the information you need to ensure you take the correct amount of fuel during the race. There are screens to tell you how much fuel you'll need to finish, your average fuel consumption, the number of laps remaining in the race (especially useful in timed races), and the number of laps of fuel remaining in your car. The software can interface with the sim to properly fill the tank during a pit stop with the push of one button. Telemetry is another huge aspect of modern racing. With two full telemetry dashboards giving you live information about tires, tire wear, tire temperature, g-forces, and driver inputs all in an easy to view graphical display, you can ensure you get the most out of your car. Try out the Z1 Dashboard sim-racing software today! Sim-racing just isn't the same without a Z1 Dashboard.